President Recep Tayyip Erdoğan shakes hands with MHP Chairman Devlet Bahçeli (L). President Recep Tayyip Erdoğan and Nationalist Movement Party (MHP) Chairman Devlet Bahçeli on Wednesday agreed not to extend the state of emergency in their first meeting after the elections, presidential sources said. 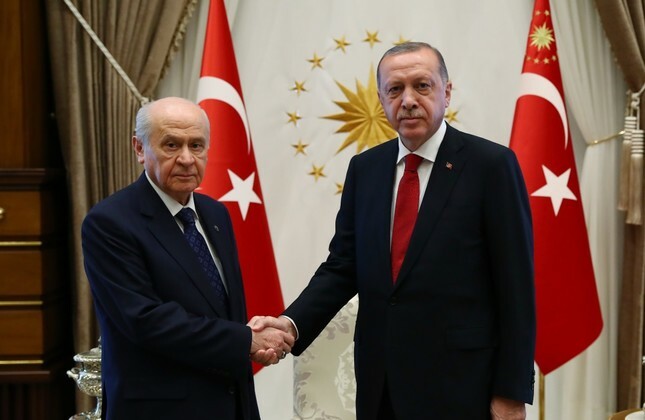 Erdoğan received Bahçeli at the Beştepe Presidential Complex in the capital Ankara, in the first meeting between the two leaders since Sunday's presidential and parliamentary elections. The meeting between the two leaders of the People's Alliance, which was formed by the Justice and Development Party (AK Party) and MHP, began at 4 p.m. local time and lasted nearly 40 minutes. In the meeting, which was closed to the press, Prime Minister Binali Yıldırım, MHP Deputy Chairmen Semih Yalçın, Celal Adan and Mustafa Kalaycı were also present. During his presidential campaign, Erdoğan pledged that if he is to be elected as the president, the first thing he will do is to lift the emergency. "After June 24, if I am given the right to continue in office, our first step will be, God willing, to lift the state of emergency," Erdoğan said in an interview with 24 TV in his hometown province of Rize. Turkey declared the current state of emergency for the first time on July 20, 2016 following a deadly coup attempt that killed 250 people and left 2,200 injured. Since then, it has been extended seven times by Parliament. The main objective of the state of emergency is to fight terror threats directed towards the country and to maintain stability. Turkey has been fighting against various terror groups including the Gülenist Terror Group (FETÖ), the PKK and Daesh. In the year-and-a-half since, security forces have arrested thousands suspected of involvement in the coup bid, many holding positions in the government and military, and are thought to pose a continuing threat. Emergency rules in a state of emergency enable the government to bypass Parliament to enact new laws. The Cabinet has the right to issue statutory decrees under the presidency without following routine procedures and restrictions.